Click on active step to change card settings. There will be shown your eCard's content. Fill in form below with send and recipient details. E-mail are required to be valid. If you want you can hide your details from recipient. Before sending please double check all details. Write a message to recipient. Message is not required but we do encourage you to send to your friend a greeting or poem. Warning! If you want to paste content here please use key conbimation "CTRL + V" on your keyboard. Make your eCards beautiful! You can set background and foreground color of your eCard. Click circle below color to change eCard's color. Adding musing to eCards is only available for registered users. In order to send eCards with music register free User Account. Here you can configure a few things before sending the eCards. Options are available only for registered users. Sign up for free account here. We will notify you when recipient view your eCard. I agree with terms and conditions of Cardsland. 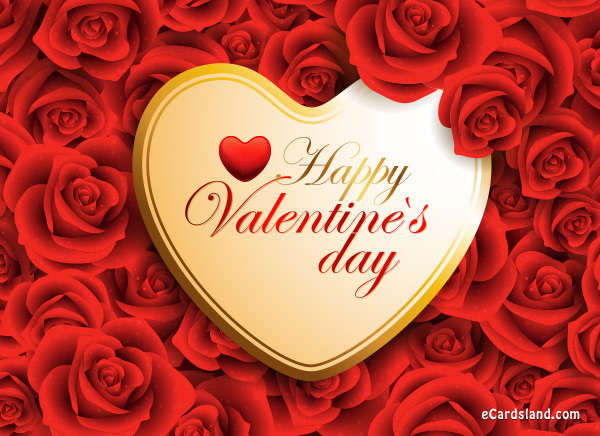 The eCard - Happy Valentie's Day eCard you selected can be even more beautiful; you can just choose a colour, a stamp, write funny wishes or choose a text from ready wishes, greetings, poems, quotes or text messages SMS. Configuration wizard is quite intuitive, so you shouldn't have any problems with making your ecard even prettier. To your free ecard you can also add music, which has been divided into categories, for your convenience. Ecards with music introduce additional ambience while reading wishes added to the ecard. The eCard - Happy Valentie's Day eCard you selected will definitely bring a lot of joy to the recipients of the e-card. Come on then - make it prettier and send your free ecard to friends.